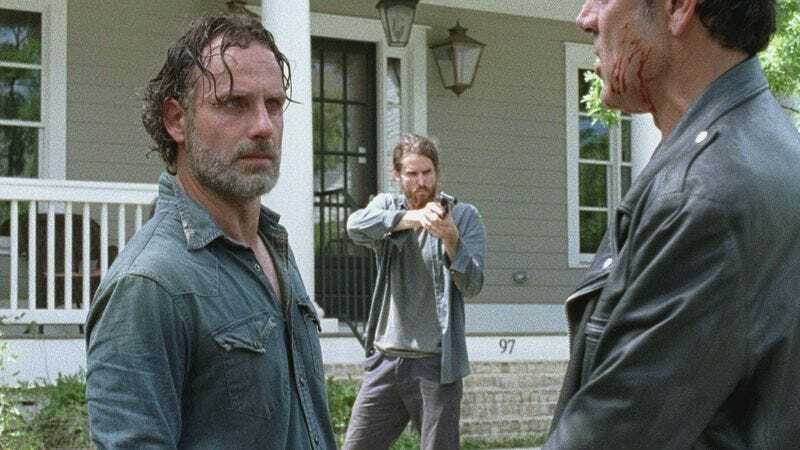 The Walking Dead reached its not so thrilling conclusion earlier this week, with yet another showdown between the Alexandria group and the Saviors. Rick and his team were prepared for all-out war when Negan and Lucille came a-knocking, but the action just kind of dribbled out over the hour. Rick was made to kneel once more, but it was in front of Jadis, the leader of the Scavengers, who all speak in broken English for whatever reason. In any case, their fight turned into a free-for-all when a Hilltop group and the Kingdom joined in, but Negan and some of his Negans lived to fight another day. Now it looks like the real all-out war will happen in season eight—unless of course, the time jump from the comics makes its way to the show. Showrunner Scott Gimple tells The Hollywood Reporter that he and his writers have been eyeing Robert Kirkman’s leap forward in the comics. There was a pretty significant jump at the 127th-issue mark, which showed us that a real Alexandria Safe Zone is eventually established in Rick’s lifetime. Gimple would only say that they’ve been considering it, but neither he nor Kirkman would confirm its deployment, or how many years we’d skip forward. Although it would be kind of a relief to move past all the Negan crap at this point, a time jump won’t fix TWD’s pacing or characterization problems, so maybe Gimple & Co. should just hold off on this particular storytelling device. In the meantime, more tigers.